Dayton, Ohio, the Birthplace of Aviation and So Much More, is a fabulous family destination! A quick and easy drive straight east on I-70, just hop in the car and have a great get-away weekend in Dayton! Come experience all of the FREE attractions and learn about famous Daytonians - Wilbur & Orville Wright who invented flight. The Dayton Aviation Heritage National Historical Park! Explore the sites of the Dayton Aviation Heritage National Historical Park to learn all about Dayton’s Wright Brothers and their childhood friend, Paul Laurence Dunbar, the first internationally recognized African American poet and writer. Talk with the National Park Rangers. Earn a Junior Park Ranger badge. Learn through movies and fun interactive displays at the Park’s two FREE Interpretive Centers---The Wright Cycle Company and Wright-Dunbar Interpretive Center and the Huffman Prairie Flying Field Interpretive Center. Try your hand at the FREE Wright Flyer Flight Simulator and stand on the hallowed grounds of Huffman Prairie Flying Field where the Wright Brothers “truly learned to fly!” You can also see the original 1905 Wright Flyer III—the only plane to be named a National Historic Landmark---at the Wright Brothers Aviation Center at Carillon Historical Park. Explore the Paul Laurence Dunbar House to learn about this famous African-American poet and writer and friend of the Wrights. Make It A Game! The world’s aviation story is not complete without a visit to Dayton, the Birthplace of Aviation. Have fun racing to Dayton’s Amazing Aviation Places to earn your very own Wilbear Wright Aviator Teddy Bear! Pick up a Wilbear Passport Brochure at any of the 16 area aviation sites. Simply visit 7 of the sites, have your passport stamped and we’ll mail you your very own Wilbear Wright Aviator Teddy Bear! Each family member can earn a bear and there is not a time limit on completing you passport. Note—you can achieve 7 stamps in one day but we recommend at least two days. The FREE National Museum of the U.S. Air Force! Open Daily 9-5pm, free admission and free parking! The world’s largest and oldest military aviation museum which currently displays over 360 aerospace vehicles and artifacts in 17 acres of enclosed hangar space. The Museum is the state’s most visited free tourist attraction with nearly 1.3 annual visitors. Displays are arranged in chronological order so it’s easy to target the time-periods where you have the most interest. The kids will love the Morphis Movie Ride Flight Simulator, eating freeze-dried astronaut ice cream in the Museum Cafeteria, or taking in a thrilling aviation movie in the Museum’s Giant Screen Digital Theatre featuring an 80’-wide screen. In the summer of 2016, the Museum will open a brand new 4th hangar featuring 224,000 square feet of exhibits including the Presidential planes and a global research gallery. You can also enjoy the co-located FREE National Aviation Hall of Fame which celebrates a century of flight pioneers. And, Dayton offers much more than aviation! The Boonshoft Museum of Discovery is a hands-on science museum that provides families the opportunities to visit animals at the Discovery Zoo, conduct experiments at the Do Lab, scout the universe at Science on a Sphere—a 3D projected glob that displays images of Earth and space. SunWatch Indian Village/Archaeological Park is a reconstructed 13th-century Indian village that reveals how the agrarian Fort Ancient Indians lived 800 years ago. Visit the museum displays, watch an informative movie, then explore the reconstructed village. Bring home a special souvenir from the gift shop. For more ideas on all there is to see and do in Dayton click on this link to the Destination Dayton Visitors Guide or call us at 800-221-8235! 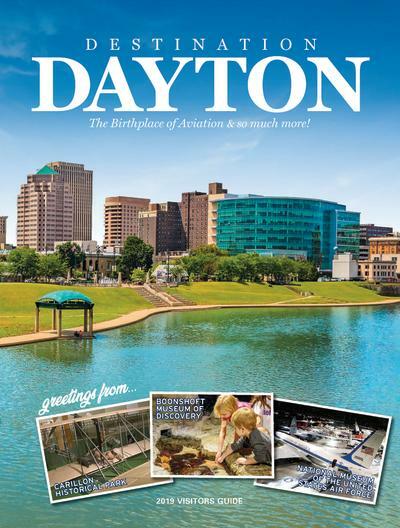 Click the photo above to view the Dayton Visitors Guide. You can learn about many family friendly events happening in the area.